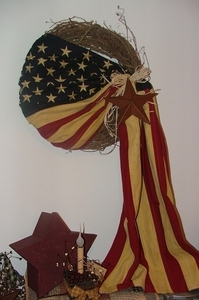 Home > Antiqued / Tea-Stained Flags > American Flag Wreath - Large 18" - 20"
The flag flows a full 2ft below the wreath, giving this wreath a majestic flair. It's constructed of 100% Cotton, a very heavy weave, and is rated for indoor/outdoor use. The stripes are double stitched and the stars are embroidered. What a great addition to any door, or wall inside your home!